This record is nothing short of amazing! 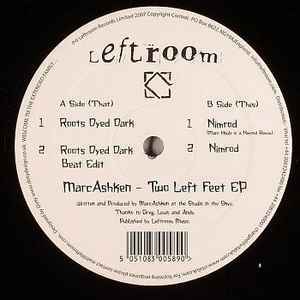 After being turned on to Leftroom with Ito & Star's Sudoko Kid EP it's not really a wonder, yet I hadn't heard of Marc Ahsken so I was pleasantly surprised to discover his unique sound. I'm not even sure how to describe it, but you HAVE to listen to Roots Dyed Dark. This has got to be one of the biggest tracks I have ever heard, which still manages to bring it down to a single note. Such a combination of rhythms I have quite possibly never heard. Build ups and drops galore, with minimal-tech-electro-dub-synth-clash all in one, somehow. I don't know how he even began to compose this, though a mastery of killing the beat and bringing it back under a new guise is certainly a deep foundation. Houle's remix of Nimrod is also notable, not to mention Nimrod itself, which is pretty funky. The remix sounds like a perfect fusion between the M-nus minimal camp-particularly Houle's synthy bleeps-and the Ashken sound which I am just beginning to discover. Really takes a nice turn about 2/3 of the way through with some mellow riffs riding out that minimal beat. A plus plus plus! There are only a few records I would rave about this much. Leftroom is definitely one to watch out for.